You are here: Home / Blog / Hardware / What is IIoT? What is IIoT? Here are the basics about the Industrial Internet of Things. 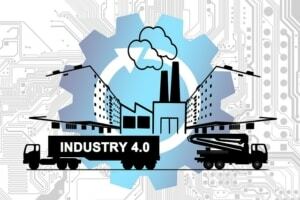 IIoT and Industry 4.0 are very similar topics. Both topics, however, are widely accepted as a key part of the future of manufacturing. Alan Rooks of the Advanced Manufacturing Podcast recently interviewed SFA. The interview touched on what exactly Industry 4.0 is. First, manufacturing was purely done via mechanical systems. We moved forward with mass production (assembly lines). Then we reached computers and automation. Now, we arrive at Industry 4, which is the Cloud. Want more info on IIoT and Industry 4.0 solutions? Call (877) 611-5825 or fill out a contact form! https://www.shopfloorautomations.com/wp-content/uploads/2018/04/SFA-Site-Logo-300x138.jpg 0 0 Amanda Rosenblatt https://www.shopfloorautomations.com/wp-content/uploads/2018/04/SFA-Site-Logo-300x138.jpg Amanda Rosenblatt2018-11-28 21:31:072019-02-05 22:41:43What is IIoT?